In a matchup that pitted two potential playoff teams, the Seahawks dominated every aspect of the game. Whether it was offense, defense, or special teams, Seattle played far superior to Minnesota as they ran away with a 38-7 win. Daniel House recaps the contest and provides his post-game notebook. In a matchup that pitted two potential playoff teams, the Seahawks dominated every aspect of the game. Whether it was offense, defense, or special teams, Seattle played far superior to Minnesota as they ran away with a 38-7 win. 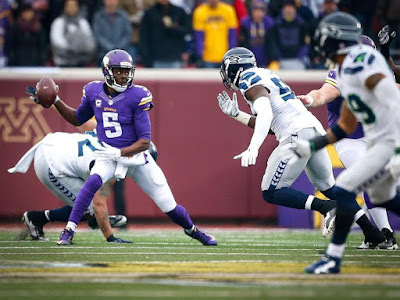 Russell Wilson diced the Vikings defense for 274 yards and three touchdowns, while adding 51 yards and a touchdown on the ground. He escaped tacklers and extended plays with his legs and powerful arm strength. The Vikings sent many pressures, but his ability to escape tackles was critical as he picked up just one sack today. Minnesota's offense was anemic and tallied just 125 total yards, while Seattle posted a whopping 433 yards. It's hard to win many games when your offense has trouble picking up first downs. Seattle shut Adrian Peterson down, holding him to 18 yards on just eight carries. Not to mention, a Thomas Rawls rushing touchdown, along with a 8-yard scamper by Russell Wilson put the Seahawks up 14-0. The Vikings got the ball back with a few minutes remaining in the first half, but an errant throw by Teddy Bridgewater was intercepted by Earl Thomas. On the next play, Wilson found Doug Baldwin for a 20-yard touchdown and Seattle entered halftime with a 21-0 lead. The Vikings offense isn't built to play from behind and they proved that today. Everything was one dimensional and check-downs were about the only pass the offense could complete. Teddy Bridgewater was out of sync, the offensive line couldn't block, and the receivers weren't getting any separation. It's hard to figure out what is going wrong with the offense. The defense struggled, but they are plagued by injuries as they play without Anthony Barr, Harrison Smith, and Linval Joseph. Seattle carved up the defense and missed tackles were a repetitive theme throughout the day. The Seahawks added a 5-yard touchdown from Wilson to Fred Jackson and they continued to rout the Vikings defense. A few drives later, Antone Exum was burned on a 53-yard touchdown pass from Wilson to Doug Baldwin. The only points the Vikings scored came from a 101-yard kickoff return touchdown by Cordarrelle Patterson. Besides that, Minnesota couldn't find anything on offense. Their defense was leaky and their special teams wasn't anything 'special' either. They don't have much time to dwell on their mistakes as they travel to Arizona for a Thursday night matchup with the Cardinals. The Vikings offense has faced continual struggles when they can't run the ball. Today was the same theme. Adrian Peterson rushed for just 18 yards on eight carries and Minnesota couldn't score any points on offense. Teddy Bridgewater was holding onto the ball too long and couldn't find his receivers down the field. There were moments the wide receivers were getting open, but Bridgewater wasn't pulling the trigger. He seemed very scared to make a mistake. The protection wasn't great either, but Bridgewater shoulders some blame too. Additionally, it's time to start talking about the play calling. The offense has become very one dimensional and when they can't run the ball, nothing else works. If two receivers can't get open, it's either a dump to a tight end or a check down to Asiata or McKinnon. It's hard to tell whether the play calling has been scaled back or whether the Vikings don't have the personnel to do anything differently. I think it's a combination of both, but it's very difficult to put a finger on these offensive struggles. Right now, it's poor offensive line protection and quarterback play, along with mediocre play calling. The Vikings need to find ways to win when they can't run the ball and they haven't been able to do that effectively yet. When the inactive list came out, Anthony Barr and Harrison Smith with both expected to play. However, after a few snaps on the field, they both left with injuries. Barr was nursing a groin injury, while Smith exited with a hamstring problem. This wasn't good as the defense was already without Linval Joseph. Jason Trusnik was filling in for Barr, while Robert Blanton substituted for Smith. Trusnik has been with the team for a few weeks, while Blanton has continually struggled to handle his coverage duties well. The more perplexing thought is how Trusnik was on the field before Brandon Watts. Nonetheless, the defense played terrible. They missed a high amount of tackles and couldn't stop anything Seattle was throwing their way. Naked bootlegs and misdirections absolutely ate this group alive. Antone Exum struggled and was beaten badly on a 53-yard touchdown to Doug Baldwin. The Vikings defense needs to get healthy quickly. It doesn't appear they'll be able to by Thursday. That could spell bad news as Arizona is one of the best team's in the NFC with a fantastic vertical passing game. After being one of the least penalized teams in the league for the first half of the season, the Vikings have taken a step back over the last three weeks. Over that stretch, the Vikings have been penalized 26 times for 258 yards. That's not a very good statistic. An unnecessary roughing penalty and a holding call helped Seattle extend a few of their drives. In the second half, the offense was penalized on three consecutive plays and started at 1st-and-38. The whole team was penalized nine times for 95 yards and continue to make a massive amount of mental mistakes. This team isn't built to be in long down situations and can't play from behind -- it's that simple. Russell Wilson wasn't contained and he made the Vikings defense pay. He continually made plays to extend drives and left the pocket to buy time for his receivers to get open. Wilson did it with his legs and arm too. He's the definition of a dual-threat quarterback that's starting to hit stride. Wilson tallied four total touchdowns and evaded every type of pressure the Vikings threw his way. He was sacked just once and proved why he is one of the most dynamic quarterbacks in football. Mike Zimmer was rather candid in his post-game press conference. He indicated some people might have been feeling too good about themselves this week. Zimmer even said, "We're not quite as good as we think we are." The Vikings started the season with a game similar to this one. They were demoralized by San Francisco, but quickly bounced back. We'll see how this squad responds to more adversity. Could this be a reality check for the final remaining stretch of the season? It might be. However, they don't have much time to get things back on track. They need to be ready to play a game against a great team in four days.